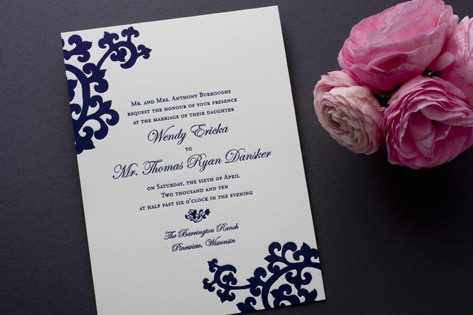 Bold color against a crisp, white backdrop evoke an elegant evening wedding affair in this letterpress wedding invitation. The ornamental flourish adds flair and drama, bringing to mind the wrought iron work found in Spanish villas. Available in navy (shown), red, and pewter.